It was during a particularly acute episode that my father first suggested an appointment with a chiropractor – I staggered into the office bent double, I walked out standing up straight. Now admittedly this doesn’t happen in every case but that experience for me was the start of my education into managing my own spinal health and eventually to helping others manage theirs. My response to chiropractic care impressed me greatly, the desire to be able to help others in a similar way was the catalyst which led to me to chiropractic college in Bournemouth in 1992. Five tough but enjoyable years of study later I was a fully qualified D.C (Doctor of Chiropractic) just beginning to realise that your ‘real’ education starts in practice. After 4 years as an Associate at ISIS Chiropractic in Aylesbury I had the opportunity to begin my own practice in Sutton Coldfield in 2000. The years of clinical experience have been a lesson; relieving musculoskeletal pain can be a challenge for both practitioner and patient. Being a witness to that process is a reward itself. 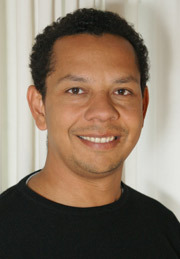 Edwin Teall is married to Gini, they have two children, Evie-Rose and Freddie. Time away from work is spent enjoying family life, holidays (particularly skiing), playing sports (squash, tennis, golf) and reading. My philosophy towards health is one truly born from my own experience. The lesson to look after your ‘self’, to care enough about yourself, can be a long, painful and unhappy one. Mine certainly has been at times. These days I respect myself enough to have regular treatment to maintain my musculoskeletal balance – to be as well adjusted as possible. I’m very aware of the fuel I choose to put in my body – you are what you eat. I also value the knowledge that if you change your mind, you change your brain. Finding peace of mind every day is an important part of my daily routine. Can The Chiropractic Studio help you? Thank you for visiting our site. I hope it can be a source of hope and healing. If you have any questions please call our Sutton Coldfield or Leamington Spa chiropractic office.